Businesses work day in and day out with Customers which need attention. CRM Software is the core of any successful business. Track your customer requests and any communication (Email, Telephony, Social Media) and increase clientel through Email Marketing, Google Ads, Facebook Ads and track your campaign progress and success rates. All from One Platform that integrates All. Your cost effective alternative to Salesforce, SAP, Microsoft Dynamics CRM. No matter what the sources are, leads are defined as objects that can be realized into sales. With this philosophy we allow you to feed the Cyprus CRM core system with leads. You can build processes, automate & analyze these leads and create conclusive reports. The goals is customer aquisition and customer retention. Every entity, contract or account ends at the customer. If any Data from the customer can be a sale, our Cyprus CRM is designed to let you know ahead of time. We helped telecom companies to automate promotion campaigns, when contracts of users with old cell phone models where close to expiration, to replace them with new models of the same brand. A pre-emptive tactic for customer retention that saved nundreds of workhours. You have already made the first contacts and know the requirements requirements. There lies the opportunity to seal the deal. 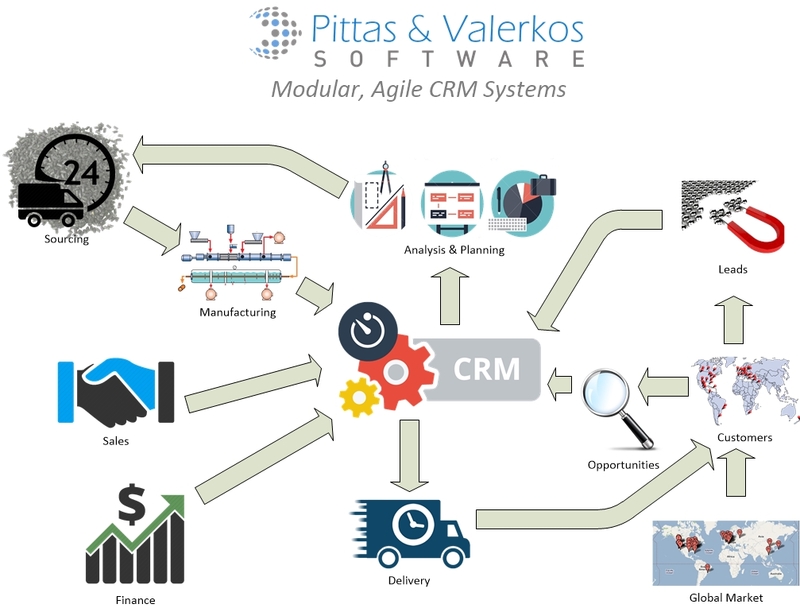 Our Cyprus CRM helps track and manage the sales pipeline management or opportunity pipeline management. By using our adaptable workflow tool, we optimize the pipeline. You have the ability to increase your insights and be informed on related factors that will help you close a deal or avoid pitfalls. Sales are running and also a number of other processes in your company. You need to be in control. You need to be informed. Everything that requires an action, becomes a task. And the Task Manager, allows you to view and manage all the tasks. Drilling down to the production floor from the sales desk is now possible. Scheduling and planning all your selling strategy is a collaborative task, and that is precisely what our Cyprus CRM does. Trends, visits, clicks eveything tells you something. Make the right decisions by knowing, not guessing. 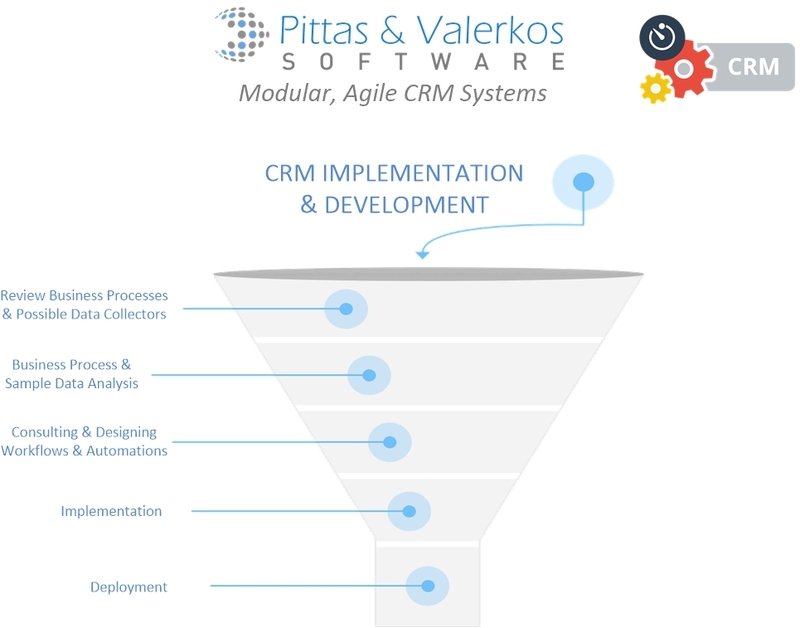 PVS Cyprus CRM listens and let's you learn in real time. Your website can be running on any technology, no problem. We have provisions that allows feeding with any type of data source: files, databases, API's, web services! The customer calls, there is no time to waste. You want to offer the best customer experience to answer questions, find information and help troubleshoot. Our customer center has streamlined these processes and allows the customer service rep to make the job with the fewest clicks possible! Call logs are automatically linked to cases by association of the contacts that exist in the Cyprus CRM. You want to make sense of data that is scattered on a number of systems and databases. You want to be able to forecast and have the right tools to make decisions. Well, we know that and that is exactly what our BI does for you. Your Key Performance Indicators can all be managed from within the Cyprus CRM, whatever your role in the company is. We offer a variety of reports and dashboards so that you can monitor everything from where you are. Know ahead of time when your assets become liabilities. From IT hardware to machinery that wears out to digital assets. We have ready made solutions that capture the value and generate conclusive reports that help your strategy. Our Cyprus CRM is ready to integrate with business processes that generate data but also accept data manually for forecasting asset management.At the end of the day, it's all about the return of investment. We have architected our Cyprus CRM around web collaboration. Whether you need to chat or share files or notes, our Cyprus CRM has the arsenal of tools that maximize your workstyle. If you work with the Google Apps you will find that we can integrate your apps with just a few clicks. Everything starts and ends within a single platform! The goal is to optimize profitability by distributing inventory to the most appropriate customers. RM and Cyprus CRM occur in lockstep, that is why we must provision so that these two exist in harmony. By understanding customer behaviours and patterns we can foresee what is coming and plan accordingly. We have built the necessary workflows so that you only need to setup what is critical to get the most out of your data. Integration with accounting and sales gives you the whole picture in easy to use reports. This is the cornerstone of our Cyprus CRM. Every table, column, every field has inherited the essentials to empower you to view what is important. Advanced Sorting by Level, Grouping By, Adding/Removing Columns, Dynamic Sums, Search as you type, Date range, Spreadsheet functions, Advanced filtering. Oh, and all are of course mobile firendly. Preset reports are an enourmous help, simply because we know what you need to know! Schedule reports, e-mail reports, Chart and map your strategy with our flexible reporting. By granular we mean access management to the last field. We know that in every step access permissions will come to play. We knew that from the beginning, that is why we made sure when architecting our Cyprus CRM to build everything around Access Management. Every object in the Cyprus CRM is governed by the AM system and thus making your apps robust and trusted. Billing systems, hardware monitoring systems, Production Machines, Measuring devices, Telephony systems, Accounting and ERP...are just a few of the systems we have built in connectors for you to feel confident that no data will be left behind. If there is a data source, you can now connect to it. Consider our Cyprus CRM your centrilized center of command! The implementation of a CYPRUS CRM system is always based on a specific scenario, which depicts the organization's business processes. Typically, a liaison consultant/analyst will create the specifications & requirements. The consultant is usually a person that knows well the technical features and capabilities of the CYPRUS CRM system and also has some knowledge about the business. 2. Put in place (and sometimes replace) new business procedures which will unleash the true potential of the CYPRUS CRM system. During this assessment the consultant should analyze how personnel carries out their daily tasks, the data that is being created or interacted with and how progress, performance and KPI's are measured to achieve business goals. In order for the above to be accurate and give the overall picture of the business needs, the consultant should conduct meetings and workshops with key personnel. These meetings & discussions will result in a set of business requirements and in turn will be translated by the analyst/consultant into a proposed set of changes in order to accommodate the CYPRUS CRM in the organization's workflow. Requirements and Specifications can be formed in a milestone approach that is releasing requirements in different phases, and/or in different sectors of the business. Each phase of these requirements will be eventually grouped together to form the complete proposed solution. Part of the assessment, is that the consultant to advise and suggest about components, modules or add-ons that fit the business needs. This addition/subtraction of features should be discussed with the executive management for approving extra costs and determining the level of implementation of the CYPRUS CRM. A CYPRUS CRM system, like any other business system, has continuous growth and adaptation into how the business evolves and progresses. Therefore, such a system should be implemented with continuity and return of investment in mind. The role of the consultant is to be pro-active and cater a solution that will take into consideration different scenarios of how the business progresses. Another aspect of implementing a CYPRUS CRM system is the roadmap of implementation, as any complex system setup, tasks must be prioritized and scheduled in order for depended tasks to take place afterwards. The roadmap should clearly state the path of implementation, taking into consideration the current resources that the business allocates in order to keep on running. In other words, the business should have a minimum impact for when deploying a new CYPRUS CRM system. Many times migration is also a big part of implementing a new system. The two pillars of migration are usually, the data migration and training of existing personnel on the new system. The consultant takes into consideration these factors and creates a transitioning phase that will allow the smooth deployment and fade-in the new CYPRUS CRM system. In general, the role of the consultant in the CYPRUS CRM implementation is of tremendous importance and must be in constant communication/coordination with the business key people. A thorough planning stage and well though strategy will save many workhours, can significantly reduce the implementation period and the result may be a perfect fit to the business goals.